Priced at an average of less than 50, Brendon Whitecross is one of the backline bargains that we need to consider. Ben takes a look at the Hawk. Brendan Whitecross, at the age of 24, has been offered to us at a price of just $258,000 or at an average of just 45.8 points per game. This is the same Brendan Whitecross who averaged a solid 88 points across 21 games in 2012 and who has delivered monstrous fantasy scores including a 133 v Essendon and a 122 v Adelaide (all back in 2012). Put simply, this Hawk can find the footy. He now has a new role distributing from the half back line. We all know the Hawks half back flank are fantasy gold, with the likes of Burgoyne (86.7 in 2014), Birchall (81.8 average in ’14) and Suckling (77.1 in ’14), all being solid options for the last few campaigns. For the past three seasons, Champion Data has rated Whitey’s kick from “above average” to “elite”, emphasising exactly why you’d expect the Hawthorn hierarchy to want the ball in this mans hands. Across his short 2013 campaign, Brendan managed to rank 2nd in uncontested marks at the club. Factor in that he had to change position and get over the mental burden of his ACL, and you’d be sure there’s more to come from him. That should be music to your ears. Beginning to enter his prime, the best of Brendan, barring any more injuries, is most certainly ahead of him. Having twice torn his ACL in the past three seasons, Hawthorn’s number 11 will come with certain risks. As unfortunate as it is to have this re-occurence, the timing of the injury meant he is fit and ready to complete 100% of the preseason (according to the linked article). Nonetheless the potential for a quick injury trade is undoubtedly there, and to further complicate matters, his run of injuries may hurt his ability to impact games until he gains some much needed confidence. Job security is another big question mark hanging over Whitecross. The Hawks have a plethora of options off the half back line including at Burgoyne, Birchall, Hodge, Duryea and Litherland. All these options are either locks, or on the brink of senior selection, so Brendan will need to be at the top of his game to get a consistent gig. JACK- As most of this series has been suggesting, keep your eyes peeled for his preseason campaign. Identify the role and strongly consider selecting Whitey if he’s either attacking off the half back flank, or has resorted to his previous half forward flank role. Another minor point worth mentioning even at this early stage is that Round 11 doesn’t appear to be an overly dreadful bye in defence. Thus at this stage, he’s very much in my plans to start on field in Round 1. Remember, don’t be too perturbed by the preseason fantasy scores, Brendan will start slow, but if a starting role is his for the taking, don’t miss out! Is Whitecross a certain Round 1 starter for you? Hope everyone had a great Christmas and New Year. The Preseason Updates will be starting shortly so be sure to look out for another series to help with your fantasy planning for the year ahead! Great Article Ben. At this stage he’s not in my team, but I will be monitoring him throughout pre-season. He’ll probably average more than a rookie and at his price, that’s the important bit. as you said, is he still best 22? I’m leaving WhiteX out at this stage, and giving him the opportunity to break into my squad based on a strong NAB showing. Got no faith in him to perform, but he’s definitely on the watchlist. Not touching him. 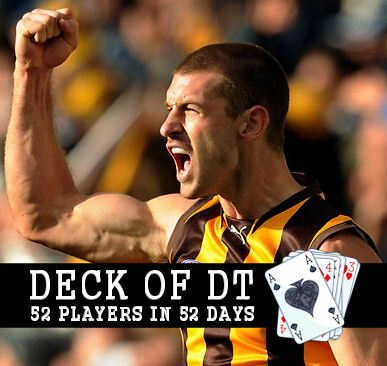 There’s no spot for him at hawthorn, and although he had a decent 2012, he was given plenty of chances with a list that doesn’t have the depth it does now… Can’t see him forcing into a team that will also be blooding young kids Jed, Hartung, Siciliy, O’Rourke, plenty more… He’ll get 10 games or so, sub in most of them… He’s a depth player, not a best 22 I reckon… But good article Benny! At his price, he’s a Lock for me. Too bad he isn’t best 22.
excellent deck of dream team.